Welcome ​bonus of 35,000 Etihad Guest Miles – one of the highest of any travel card in the Middle East! Free Comp​anion Ticket – not available on any other Card in the Middle East! 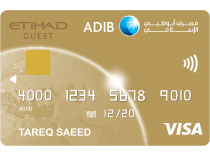 Pay your ADIB Etihad Guest Covered Card Annual fees using 30,300 Etihad Guest Miles (click here to pay). As a welcome bonus, you will receive 35,000 Etihad Guest Miles – enough for a return trip from Abu Dhabi to any destination in Egypt, Jordan, Lebanon, Syria, India, Sri Lanka, Pakistan, Nepal, Sudan or Turkey! Or you can take 2 trips to Saudi Arabia, Kuwait or Tehran, or 3 trips to Muscat, Doha or Bahrain. And with every purchase you make with your ADIB Etihad Guest Gold Card you will earn up to 1.5 Etihad Guest Miles for every AED 4 spent (to a maximum of 100,000 Miles per month). What’s more, with the unique “Miles plus Cash” feature of Etihad Guest, you can travel to any destination on the Etihad Airways network. When you spend AED 150,000 or more with your ADIB Etihad Guest Gold Card, you will receive a free Companion Ticket Voucher to fly on Etihad Airways – to any destination – in any class of travel – anywhere in the world! AED 150,000 eligible retail transaction must be posted in statement before the companion ticket cycle is completed. For more T&Cs on the free companion ticket click here. With your ADIB Etihad Guest Gold Card, experience the benefits of Etihad Guest Silver Tier even faster! When you complete 4 return flights on Etihad within 12 months of card issuance, you will be fast tracked to Etihad Silver Tier. Whether you need to concentrate on work or you want to relax in a comfortable environment, your pre-flight experience makes all the difference to your journey ahead. Now your ADIB Etihad Guest Visa Gold Card opens the doors to over 850 VIP airport lounges across the globe! As an ADIB Etihad Gold Card holder you will be eligible for 2 free visits per year.